This chapter outlines the concept behind supervision, the primitives offered and their semantics. For details on how that translates into real code, please refer to the corresponding chapters for Scala and Java APIs. It is important to always view an actor as part of a supervision hierarchy, which explains the existence of the fourth choice (as a supervisor also is subordinate to another supervisor higher up) and has implications on the first three: resuming an actor resumes all its subordinates, restarting an actor entails restarting all its subordinates (but see below for more details), similarly terminating an actor will also terminate all its subordinates. It should be noted that the default behavior of the preRestart hook of the Actor class is to terminate all its children before restarting, but this hook can be overridden; the recursive restart applies to all children left after this hook has been executed. Each supervisor is configured with a function translating all possible failure causes (i.e. exceptions) into one of the four choices given above; notably, this function does not take the failed actor’s identity as an input. It is quite easy to come up with examples of structures where this might not seem flexible enough, e.g. wishing for different strategies to be applied to different subordinates. At this point it is vital to understand that supervision is about forming a recursive fault handling structure. If you try to do too much at one level, it will become hard to reason about, hence the recommended way in this case is to add a level of supervision. Akka implements a specific form called “parental supervision”. Actors can only be created by other actors—where the top-level actor is provided by the library—and each created actor is supervised by its parent. This restriction makes the formation of actor supervision hierarchies implicit and encourages sound design decisions. It should be noted that this also guarantees that actors cannot be orphaned or attached to supervisors from the outside, which might otherwise catch them unawares. In addition, this yields a natural and clean shutdown procedure for (sub-trees of) actor applications. Supervision related parent-child communication happens by special system messages that have their own mailboxes separate from user messages. This implies that supervision related events are not deterministically ordered relative to ordinary messages. In general, the user cannot influence the order of normal messages and failure notifications. For details and example see the Discussion: Message Ordering section. 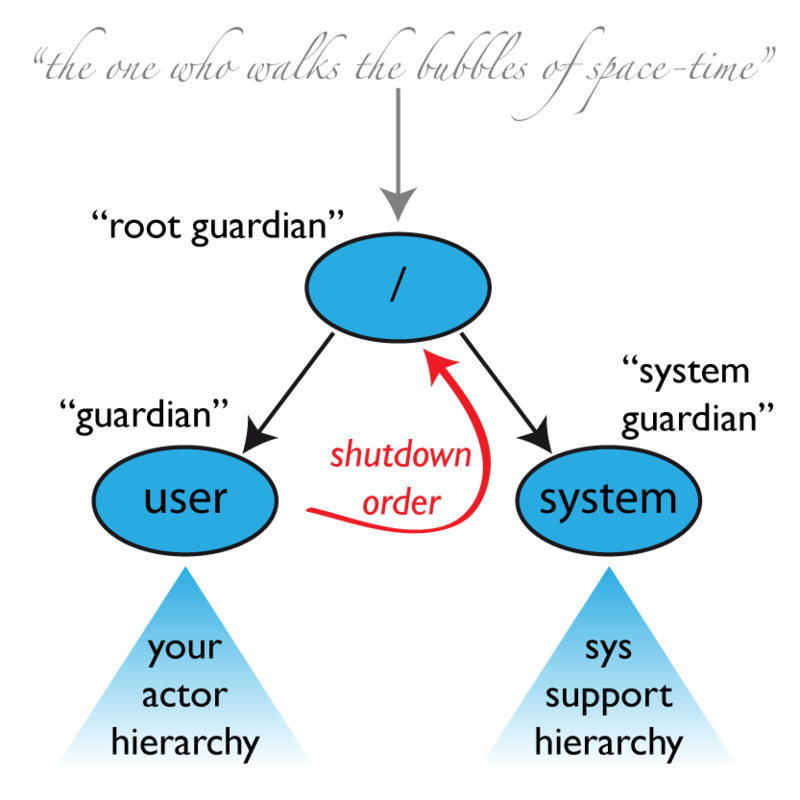 An actor system will during its creation start at least three actors, shown in the image above. For more information about the consequences for actor paths see Top-Level Scopes for Actor Paths. The actor which is probably most interacted with is the parent of all user-created actors, the guardian named "/user". Actors created using system.actorOf() are children of this actor. This means that when this guardian terminates, all normal actors in the system will be shutdown, too. It also means that this guardian’s supervisor strategy determines how the top-level normal actors are supervised. Since Akka 2.1 it is possible to configure this using the setting akka.actor.guardian-supervisor-strategy, which takes the fully-qualified class-name of a SupervisorStrategyConfigurator. When the guardian escalates a failure, the root guardian’s response will be to terminate the guardian, which in effect will shut down the whole actor system. This special guardian has been introduced in order to achieve an orderly shut-down sequence where logging remains active while all normal actors terminate, even though logging itself is implemented using actors. This is realized by having the system guardian watch the user guardian and initiate its own shut-down upon reception of the Terminated message. The top-level system actors are supervised using a strategy which will restart indefinitely upon all types of Exception except for ActorInitializationException and ActorKilledException, which will terminate the child in question. All other throwables are escalated, which will shut down the whole actor system. The root guardian is the grand-parent of all so-called “top-level” actors and supervises all the special actors mentioned in Top-Level Scopes for Actor Paths using the SupervisorStrategy.stoppingStrategy, whose purpose is to terminate the child upon any type of Exception. All other throwables will be escalated … but to whom? Since every real actor has a supervisor, the supervisor of the root guardian cannot be a real actor. And because this means that it is “outside of the bubble”, it is called the “bubble-walker”. This is a synthetic ActorRef which in effect stops its child upon the first sign of trouble and sets the actor system’s isTerminated status to true as soon as the root guardian is fully terminated (all children recursively stopped). Unless the failure is specifically recognizable, the third cause cannot be ruled out, which leads to the conclusion that the internal state needs to be cleared out. If the supervisor decides that its other children or itself is not affected by the corruption—e.g. because of conscious application of the error kernel pattern—it is therefore best to restart the child. This is carried out by creating a new instance of the underlying Actor class and replacing the failed instance with the fresh one inside the child’s ActorRef; the ability to do this is one of the reasons for encapsulating actors within special references. The new actor then resumes processing its mailbox, meaning that the restart is not visible outside of the actor itself with the notable exception that the message during which the failure occurred is not re-processed. In contrast to the special relationship between parent and child described above, each actor may monitor any other actor. Since actors emerge from creation fully alive and restarts are not visible outside of the affected supervisors, the only state change available for monitoring is the transition from alive to dead. Monitoring is thus used to tie one actor to another so that it may react to the other actor’s termination, in contrast to supervision which reacts to failure. Lifecycle monitoring is implemented using a Terminated message to be received by the monitoring actor, where the default behavior is to throw a special DeathPactException if not otherwise handled. In order to start listening for Terminated messages, invoke ActorContext.watch(targetActorRef). To stop listening, invoke ActorContext.unwatch(targetActorRef). One important property is that the message will be delivered irrespective of the order in which the monitoring request and target’s termination occur, i.e. you still get the message even if at the time of registration the target is already dead. Monitoring is particularly useful if a supervisor cannot simply restart its children and has to terminate them, e.g. in case of errors during actor initialization. In that case it should monitor those children and re-create them or schedule itself to retry this at a later time. Another common use case is that an actor needs to fail in the absence of an external resource, which may also be one of its own children. If a third party terminates a child by way of the system.stop(child) method or sending a PoisonPill, the supervisor might well be affected. There are two classes of supervision strategies which come with Akka: OneForOneStrategy and AllForOneStrategy. Both are configured with a mapping from exception type to supervision directive (see above) and limits on how often a child is allowed to fail before terminating it. The difference between them is that the former applies the obtained directive only to the failed child, whereas the latter applies it to all siblings as well. Normally, you should use the OneForOneStrategy, which also is the default if none is specified explicitly. The AllForOneStrategy is applicable in cases where the ensemble of children has such tight dependencies among them, that a failure of one child affects the function of the others, i.e. they are inextricably linked. Since a restart does not clear out the mailbox, it often is best to terminate the children upon failure and re-create them explicitly from the supervisor (by watching the children’s lifecycle); otherwise you have to make sure that it is no problem for any of the actors to receive a message which was queued before the restart but processed afterwards. Normally stopping a child (i.e. not in response to a failure) will not automatically terminate the other children in an all-for-one strategy; this can easily be done by watching their lifecycle: if the Terminated message is not handled by the supervisor, it will throw a DeathPactException which (depending on its supervisor) will restart it, and the default preRestart action will terminate all children. Of course this can be handled explicitly as well. Please note that creating one-off actors from an all-for-one supervisor entails that failures escalated by the temporary actor will affect all the permanent ones. If this is not desired, install an intermediate supervisor; this can very easily be done by declaring a router of size 1 for the worker, see Routing or Routing.